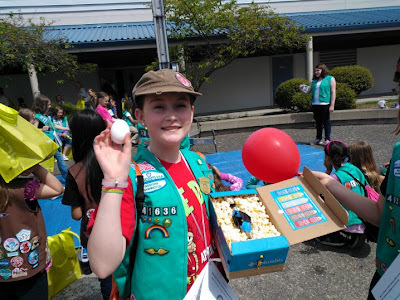 A few weeks ago The Girl had a Girl Scout event where they encouraged the girls to come up with a container that would cushion an egg and allow it to survive a 30 foot drop. Well, both the kids love a challenge like that. So we set to work building Egg Survival Suits. The Girl wanted to use popcorn as her cushioning material and found a box to hold it all, but she wanted to make some sort of net/hammock from rubber bands and balloons in the middle to hold the egg and keep it from rattling around in the box of popcorn. She then added a couple of balloons on top and bottom. The Boy wanted to use mostly balloons for cushion making an orbit of balloons around a small egg carton then added a parachute and a couple of extra balloons to put it over the top. When they were finished building, we added one of our backyard chicken's eggs then dropped the Survival suits from the top of our tree house. Both kids' contraptions kept the eggs safe. So we had to drop them again! 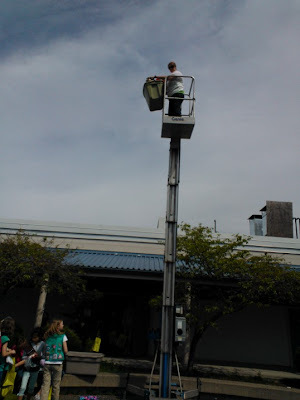 And both survived the second drop as well, although The Boy lost a balloon in the second round. The Girl took her Survival suit to the Girl Scout event the next day. Her egg survived through both the 20ft drop and the 30ft drop! She was very excited! I love this kind of activity. Both kids used their engineering skills to create something from their imagination, then got to test it in a real world situation...and most importantly of all, they had a blast!